We went back to Ipoh last week. Sofia seemed happy to finally go out on the trip as I've been packing repacking her stuffs in front of her since days ago (ini baju Sofia, ini seluar Sofia...). When travelling with a baby, expect the journey to be longer than usual. I learnt that from the very first time going back to Ipoh with Sofia when she was 3 months old. We had to stop a lot of times to change her diaper and also to prepare milk for her. When packing for a baby, I learnt that everything must have extra. But seriously, until now I'm still not sure how much extra is extra. Ended up extra tak jadi extra pun. Hahahah. Packing for myself and my husband would be; sepasang baju tidur, sepasang baju harian... But for Sofia, it would be; sepasang baju tidur dan extra sepasang, sepasang baju harian dan extra sepasang... Pampers? All this while, so far I managed to pack just enough. Just. Enough. Cukup-cukup je. Kalau ada apa-apa hal lagi jadi, memang dah tak cukup dah. But on our recent trip to Ipoh, sampai rumah je masih ada baki 2 keping lagi. I calculated like this; 1 keping pampers 4 jam. Trip 24 jam (one day trip only), bahagi dengan 4 dapat 6. Jadi 6 keping. So I brought 10 pieces. Extra 4. But ended up baki 2 je tinggal sebab lepas tukar pampers je Sofia pun berakkkkkk....... And we had to stop again. Tak jem sangat pun, yang lebihnya banyak berhenti. I learnt to be patient. VERY PATIENT. Omg the patience needed, seriously, you really need it. 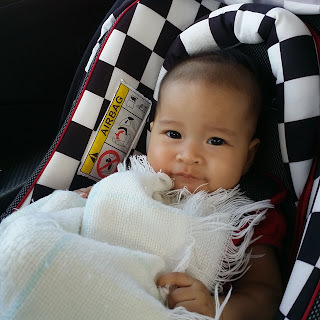 Alhamdulillah, Sofia is getting used to her carseat already. At first I thought I could have my own sweet time playing with my phone while she's in there, but the truth is, not really. In order to get her staying in there, I have to play with her, look at her, make her feel that it is okay to sit there. Except when she's sleeping, then masa tu I got time. But kesian at the driver sitting alone in front pulak. Hahaha. Anyhow, I'm starting to get used to travelling with Sofia. It is fun also to see her excited at simple things (that don't really amuse us adults), like kipas and lampu. We brought her to UTC Perak. Out of all things, she was really interested in our rainbow umbrella (it was raining sikit that time). Like, seriously? We brought you to UTC kut. Her father said, "Baik bukak payung kat rumah je..."
Oh. But she got really interested in the huge fan on the ceiling, though. Always the kipas. sya ingat lagi dlu2 zaman x matang, adam was 3 mo cmtu, sya drive alone dengan adam from putrajaya to perak. dengan kereta terhuyung hayang sbb tersengguk x ckp tido (ep mom time tu) phewww.. gile betol. Uih... Kelantan ke Melaka???? Gila la Mek! Kesian kat baby, kesian kat driver juga... Bila baby bising, nak drive pun tak senang hati kan..
Yeke... Itu i perasan sekarang dia dah makin okay dalam carseat. I selalu baca your blog for tips travel dengan anak kecil.